It is with great sadness, that the family of Bobby Dale Griffin announces his passing on Wednesday, April 3rd, 2019 at the age of 75. Bobby will be lovingly remembered by Marilyn his wife of 52 years, their sons Matt Griffin (Sara) and Mike Griffin (Jeni), daughter Mendy Muhm (Matt), their precious grandchildren Jack and Luke Griffin, Wyatt, Linley, Gus and Liza Griffin, Sage and Eleanor Muhm, his brother Gary Griffin (Sandy), his sister Genie Strakal (Mike), and his many nieces and nephews. He was preceded in death by his parents, Theodore and Mary Griffin. Bobby was born on February 2nd, 1944 in Tulsa, Oklahoma. He graduated from Tulsa Edison High School in 1962 and Oklahoma State University in 1966. At OSU he was a member of Sigma Nu fraternity and was chosen as all university athlete and met Marilyn, the love of his life and many great lifelong friends. Throughout his career he worked for the Tulsa Planning Commission, Xerox, as a broker and realtor, and was an owner manager of Tiffany Park Bowl for 25 years. His family remembers him as kind, encouraging, and loving. He provided the family with many humorous moments. There is nothing better than a Bobby Griffin story. He was a loyal friend to all and never met a stranger. In his youth, his family was actively involved in the Palomino Association. 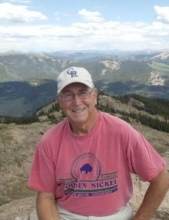 He was an avid golfer, bowler, and sports fan. He enjoyed coaching his children and grandchildren in many sports. He loved all of the family golden retrievers and will be missed dearly by his constant companions, Bob and Cowboy Griffin. A celebration of life is scheduled for Friday, April 12th at 2pm at First Presbyterian Church at 709 South Boston Avenue in Tulsa. The family invites you to a reception following the service at the Stokely Event Center at 10111 East 45th Place in Tulsa. In lieu of flowers, donations may be made in his memory to: The Leukemia & Lymphoma Society at donate.lls.org. In lieu of flowers, Mr. Griffin's family requests contribution be made to Leukemia & Lymphoma Society. "Email Address" would like to share the life celebration of Bobby Dale Griffin. Click on the "link" to go to share a favorite memory or leave a condolence message for the family.